We are busy bees again! Preparing for our upcoming production of "Ragnarok"! And since this is the centralized location to get all your info on our productions, we are sharing everything you need to know about the show right here on our blog! Below you will find our postcard images, and abbreviated press release. Tickets are onsale now! Written by Katherine Harroff in collaboration with members of the Live-Action Role-Playing Community of San Diego. Opening: November 23rd, Show Runs: November 25th- December 10th. (Dark on Thanksgiving). “Ragnarok" is the second production of the freshly- conceived Theatre Workshop called Circle Circle dot dot. 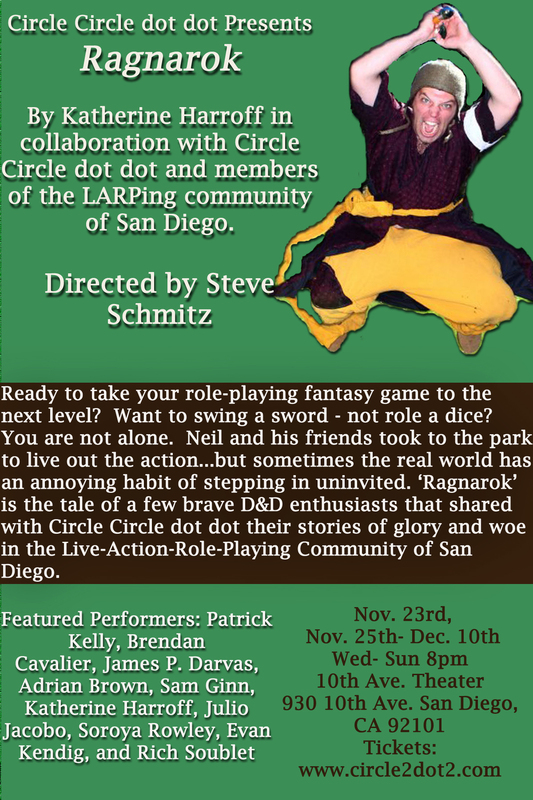 This production features reflective stories from a few brave D&D enthusiasts that decided to take part in the “LARP” (Live-Action Role-Play) Community of San Diego. Playwright Katherine Harroff, Director Stephen Schmitz, and Company Members of Circle Circle dot dot have once again collaborated to create an original production that gives audiences a glimpse into the lives of members of different communities of San Diego. ‘Ragnarok’ is an explorative performance of true stories shared with Circle Circle dot dot by real LARPers that live in our society. *Show appropriate for ages 13+. Some mature language and adult content. www.circle2dot2.com before the show, or by e-mailing circle@circle2dot2.com for reservations. Student/Senior/Military/Actors Alliance tickets are $15. General Admission is $20. SHOWTIMES: Opening: November 23rd. Show Runs: November 25th- December 10th (Dark Thanksgiving) All performances are at 8pm. Wednesday-Sunday. IMAGES/PHOTOGRAPHS for RAGNAROK or of the Circle Circle dot dot company can be obtained by e-mailing circle@circle2dot2.com. If there is any other information anyone needs feel free to contact us at circle@circle2dot2.com! We are very excited about this production! Buy those tickets! Opening night (November 23rd) will include a post-show party!